← Still in the dark! At 9 PM this Saturday, the UFC will broadcast their first fight on Fox. This is a major jump for the organization as their newly contracted relationship with Fox begins. The UFC will be reaching a whole new market of individuals on Saturday, being on network television for the first time may bring the sport of MMA to millions of new viewers and possible fans. Dana White is committed expanding his brand to become one of the major sports organizations across the globe, and this budding relationship with Fox is an incredible step in attempting to achieve that goal. The UFC has already started an attempt at a worldwide takeover by holding cards in Canada, Brazil, and the U.K., while planning an event in Japan early next year. This primetime network event may also help legitimize the organization to some viewers who believe that mixed martial arts is simply a bloodsport. The athletes in the main event on Saturday will surely put on a show that highlights their skill, technique, and commitment to training that hopefully changes the minds of the MMA haters out there. 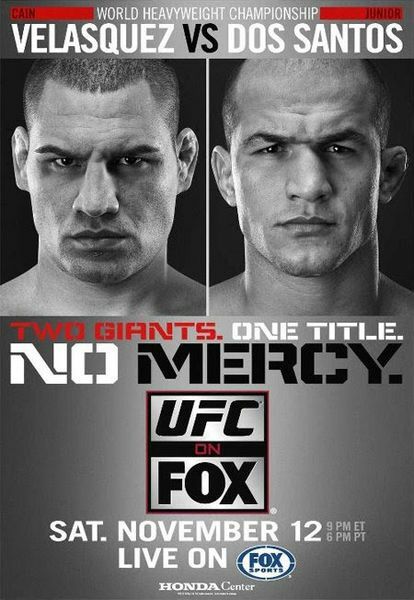 The only bout that will be featured on the Fox card will be a Heavyweight Championship bout between Junior Dos Santos and champ Cain Velasquez. Dana White may have been praying that his cash cow Brock Lesnar was available for the organization’s network debut, but these two brawlers will certainly show the world why MMA and the UFC belong on the national stage. Both fighters have demolished the rest of the heavyweight division and are both on a collision course for an absolute war on Saturday night. As indicated by their records, these guys do not like to lose. Both have steamrolled through the division on their way to this fight. 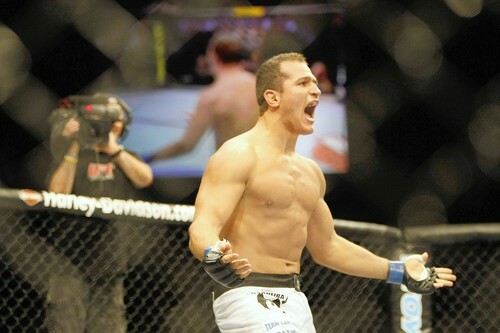 The challenger, Dos Santos, is undefeated in his seven UFC bouts. Junior has become known for his heavy hands by knocking out the likes of Struve, Gonzaga, Yvel, and Werdum; he even literally broke the face of MMA legend Mirko Cro Cop at UFC 103. He is coming off two decision wins over perennial UFC contenders Shane Carwin and Roy Nelson. Dos Santos will be looking to keep this fight standing, as his boxing is heralded in the MMA community, and the champ across the cage is one of the most accomplished wrestlers in the organization. Cain Velasquez has never tasted loss in his MMA career. Cain was a two-time All-American wrestler at Arizona State University, where he wrestled with fellow UFC athletes Ryan Bader and C.B. Dolloway. Velasquez has knocked out ALL of his opponents, except for Cheick Kongo, who has one heck of a chin–just ask Pat Barry . . . The Champ’s last three wins were all knockouts of top-shelf fighters. It took him a combined four rounds to knockout Ben Rothwell, ‘Big Nog’, and Brock Lesnar. The amazing thing about the champ is that his boxing is not truly the strongest aspect of his fight game. He is a wrestler at heart, and he can dominate anyone in the division on the ground, but his amazing athleticism has allowed for his striking to grow and develop every time he enters the cage. This uncanny athleticism, combined with his extremely polished wrestling skill, makes Velasquez a perfect specimen for the UFC to show off to a national audience. Prediction: If you ask the odds makers in Vegas, Velasquez has the slight edge in this fight. I deliberated over this fight for a while; both guys will be looking to go to war and put on a great show. Anything could happen when fists are flying between two heavyweights, but a few details have me leaning towards one competitor over the other. Velasquez has been a dynamo in the cage, but he has not defended his belt in over a year. Over the last year, Dos Santos has had a stint on The Ultimate Fighter as a coach, and he defeated top contender Shane Carwin in June. Junior’s proximity to the cage and earning the experience of a win over another top-flight wrestler will surely help him when he enters the Octagon on Saturday. Cain has also never really faced an elite striker in his short MMA career. The best striker he has faced has been Cheick Kongo, and that was the only fight that the champ has needed the judge’s scorecards to earn a win. I believe that Dos Santos will be able to stand and bang with Velasquez and could give the champ fits as they exchange blows. This is truly a toss-up, but I’m giving Dos Santos the edge here. I truly do not know what to expect from Velasquez after his long lay off from the cage. Junior Dos Santos by TKO. Becomes UFC Heavyweight Champion. This one could truly go either way, but you have my take. Let us know what you think! This entry was posted in Commentary, MMA, Opinion and tagged Cain Velasquez, Junior Dos Santos, UFC on Fox. Bookmark the permalink.